The Russian Navy's Typhoon Class submarine tops the list of the world's biggest submarines, closely followed by Russia's newest submarine the Borei Class and the enormous Ohio Class, the biggest submarine ever built for the US. Naval-technology.com profiles the world's biggest submarines based on submerged displacement. The Typhoon Class is the biggest submarine ever built in the world. Image courtesy of Bellona Foundation. The Borei Class submarine can carry the 45t Bulava submarine-launched ballistic missile. Image courtesy of Asitimes. The Ohio Class is the biggest submarine operated by the US Navy. Image courtesy of the US Navy. The Delta IV submarines are strategic nuclear missile submarines. The Vanguard Class of nuclear-powered ballistic missile submarines are the fifth biggest submarines in the world. Image courtesy of BAE Systems. The Triomphant Class is operated by French Navy's nuclear deterrent strike force. The Akula Class can carry up to 12 submarine-launched cruise missiles. The Sierra Class is operated by the Russian Navy. The Seawolf is a nuclear-powered fast attack submarine class operated by the US Navy. Image courtesy of the US Navy. Ambush, the second submarine of the Astute Class, was commissioned in March 2013. Image courtesy of BAE Systems. The Typhoon, with a submerged displacement of more than 48,000t, is the world’s biggest submarine class. It is a nuclear-powered submarine equipped with ballistic missiles. Dmitry Donskoy, the first of the six submarines in the class, was commissioned in 1981 and is still in active service with the Russian Navy. Typhoon Class submarines have a length of 175m, beam of 23m and draught of 12m. It is powered by two nuclear water reactors, two 50,000hp steam turbines and four 3,200KW turbogenerators. It can sail at a speed of 22.2kt on the surface and 27kt below water. Multiple pressure hulls make the Typhoon wider than any other submarine. Crew members can comfortably live aboard for as long as 120 days. The submarine carries 20 RSM-52 intercontinental three-stage solid propellant ballistic missiles capable of holding 100kt of nuclear warheads each. It is also equipped with six 533mm (21in) torpedo tubes and type 53 torpedoes. The Borei Class, which has a submerged displacement of 24,000t, ranks as the world’s second biggest submarine. It is a nuclear-powered missile carrying submarine serving the strategic naval forces of Russia. The first Borei Class submarine, Yury Dolgoruky, was inducted into the pacific fleet of the Russian Navy in January 2013. It was designed by Rubin Design Bureau and constructed at a cost of $770m. Two more Borei Class submarines named Vladimir Monomakh and Knyaz Vladimir are currently under development. Borei Class measures 170m long, has a beam of 13.5m and draught of 10m. Its power plant consists of a ??-650? nuclear reactor, one steam turbine, one shaft and propeller. It sails at 15kt speed on the surface and 29kt when submerged. The submerged endurance is dependent on the availability of food stores. The submarine carries 16 missiles and 45t Bulava submarine launched ballistic missile (SLBM). The armoury also includes six multiple independently targetable re-entry vehicle warheads, six 533mm torpedo tubes and RPK-2 Viyuga cruise missiles. The Ohio Class submarine is the third biggest in the world. The US Navy operates 18 Ohio class nuclear-powered submarines, which are the biggest submarines ever built for the US. Each sub has a submerged displacement of 18,750t. The first submarine of the class, USS Ohio was built by the Electric Boat Division of General Dynamics Corporation in Groton. It was commissioned into service in November 1981. All the other submarines were given names of the US States, except USS Henry M. Jackson, which was named after a US senator. Each Ohio Class submarine has 170m length, 13m beam and 10.8m draught. The gliding speed on surface is 12kt and under the water is 20kt. The submarine class includes one S8G pressurised water reactor, two geared turbines, one auxiliary diesel motor with 242KW and one shaft with seven-bladed screw. The submarine is capable of carrying 24 Trident missiles. The armament also includes four 53cm Mark 48 torpedo tubes. Delta Class, currently the fourth biggest submarine in the world, is a large ballistic missile submarine constructed by Severodvinsk. The Delta Class includes Delta I, II, III and IV sub-classes. The submerged displacement of the Delta IV submarine is 18,200t. The first Delta Class submarine was commissioned into service in 1976. Delta Class III and IV submarines are currently in operation with the Russian Navy. Five Delta III and six Delta IV submarines are currently active. The submarine has a length of 166m, beam of 12.3m and draught of 8.8m. The power plant includes two pressurised water-cooled reactors and two steam turbines driving two five-bladed fixed-pitched shrouded propellers. The submerged speed of the submarine is 24kt. The armoury includes D-9D launch tubes for 16 R-29D SLBMs, four 533mm and two 400mm torpedo tubes. The Vanguard Class has a submerged displacement of 15,900t, making it the fifth biggest submarine in the world. The nuclear-powered ballistic missile submarine is in service with the UK’s Royal Navy. The class consists of four submarines, namely Vanguard, Victorious, Vigilant and Vengeance. The submarines were built by Vickers Shipbuilding and Engineering. The first sub in the class, HMS Vanguard, was commissioned in 1993. All the submarines are based at HM Naval Base Clyde, which is located 40km west of Glasgow, in Scotland. The Vanguard Class submarines are 149.9m long and have a beam of 12.8m and draught of 12m. Its main machinery includes one pressurised water reactor supplied by Rolls-Royce, two 20.5MW turbines manufactured by GEC, two auxiliary retractable propulsion motors and one shaft pump jet propulsor. In addition, two turbo generators and two diesel alternators are installed aboard. The submarine is armed with 16 Trident II missiles and four 533mm torpedo tubes. It has a submerged speed of 25kt. The 14,335t (submerged displacement) Triomphant Class is currently the sixth biggest submarine in the world. The nuclear ballistic missile submarine serves the French Navy and is part of the French Navy’s nuclear deterrent strike force. The class includes four submarines, namely Le Triomphant, Téméraire, Vigilant and Terrible. The lead submarine was commissioned into the French Navy in 1997. Each submarine has a length of 138m, beam of 12.50m and draught of 10.60m. The propulsion system includes a pressurised water K15 nuclear reactor, two SEMT Pielstick diesel-alternators, a turboreductor system and 8PA4V200 SM auxiliary motors. The surface speed is 25kt. The submarine is armed with 16 M45 intermediate-range missiles. The weaponry also includes TN 75-tipped missiles, four 533mm torpedo tubes and F17 torpedoes. The Akula Class is a nuclear-powered attack submarine with a submerged displacement of 13,800t. 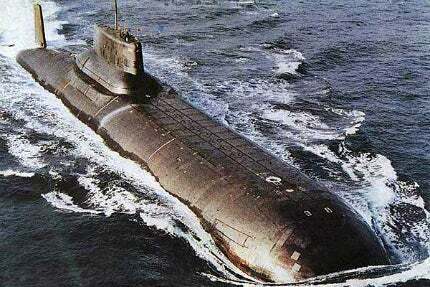 It includes ten submarines, of which nine are in the Russian Navy’s service and one in the Indian Navy’ service. The first sub in the class, Akula, was commissioned into the Soviet Navy in 1984. The submarine features a double hull composed of an inner pressure hull and an outer light hull. It is 110m in length, has a beam of 13.6m and draught of 9.7m. The surface speed of the sub is 10kt, while the submerged speed is 35kt. The submerged endurance is 100 days. Its main machinery includes one pressurised water nuclear reactor, one steam turbine and two turbogenerators rated at 2,000KW. The propulsion system includes one seven-bladed propeller and one retractable electric propulsor for reduced speed cruising. The submarine can be armed with up to 12 submarine-launched cruise missiles capable of carrying nuclear warheads up to a range of 3,000km. The armament also includes four 533mm torpedo tubes and four 650mm torpedo tubes. The Sierra Class with a submerged displacement of 10,400t ranks as the world’s eighth biggest submarine. Four Sierra submarines are currently in service with the Russian Navy. Sierra II, an improved version of the class, entered into service in 1990. The Sierra Class submarines are built with light and strong titanium pressure hull, which allows the submarine to reach greater depths and reduces the level of radiated noise. It also increases resistance to torpedo attacks. The submarine has a length of 111m and beam of 14.2m. The main equipment includes one pressurised water nuclear reactor, two emergency motors, one shaft and two spinners. The submerged speed is 32kt. The assault equipment includes four 650mm torpedo tubes, four 530mm torpedo tubes, SS-N-21 Sampson SLCM, SS-N-15 Starfish anti submarine weapon, SS-N-16 Stallion and 42 mines. The Seawolf Class of nuclear-powered fast attack submarines operated by the US Navy is the ninth biggest submarine class in the world. The submerged displacement of the class is 9,138t. The lead sub, Seawolf (SSN21), was inducted into service in July 1997. Seawolf Class is designed to combat the threat of advanced Soviet ballistic missile submarines. Three submarines of the class are currently in the service. The hull of the submarines is constructed using HY-100 steel. The length and beam of the Seawolf class are 107m and 12m respectively. The submarine is equipped with one pressurised water nuclear reactor, one secondary propulsion submerged motor, one shaft and one propeller. The speed is 18kt on surface and 35kt when submerged. The submerged endurance is unlimited depending on food supplies. The armament fitted in the submarine includes eight 660mm torpedo tubes, 50 Tomahawk cruise missiles and Mk-48 torpedoes. The Astute Class is the tenth biggest submarine in the world. It has a submerged displacement of 7,400t. The nuclear-powered submarine class is in service with the British Royal Navy. It was constructed by BAE Systems Submarine Solutions. The class includes two submarines, both of which are currently active. The first submarine Astute was commissioned in August 2010 and the second submarine Ambush was commissioned in March 2013. The submarine has a length of 97m, beam of 11.3m and draught of 10m. It is equipped with two pressurised water reactors made by Rolls-Royce and MTU diesel generators of 600KW. It can operate at 30kt of speed under water. The armament in the submarine includes six 533mm torpedo tubes, Tomahawk Block IV land-attack cruise missiles and Spearfish wire-guided heavyweight torpedoes. The eminence of aircraft carriers as floating air bases has been proven since World War II. A large naval contingent at this year’s Defence Security Equipment International proved to be one of the most popular attractions.